Dix 38 built in Caernarfon, Wales. Here is a moderate sized steel yacht of modern styling and with the performance to go with it. Radius chine hull shape gives good looks, efficiency and enhanced resale value. See the Dix 38 Pilot for the same hull with a pilothouse deck. Shallow and deep keel options. This one was commissioned as a boat of modern concept with good performance and international appeal. It was to depart as far as practical from the boxy image of most steel boats while maintaining ease of construction. The resulting design has very clean and gimick-free styling, essential for economical construction of a metal design. Within that concept, she includes many modern features to ease life on board. Hull shape is radiused chine round bilge, with long waterline and clean underbody. The long waterline increases the load carrying ability, reduces the canoebody depth and fines up the entry for wave penetration. The stern is fairly beamy with a flat run to give a clean and flat wake, with resultant ease of control off the wind. The overall result is a reduction in wavemaking both fore and aft and improved speed through the water. A conical stem plate is used to increase flare in the bows, providing more reserve buoyancy and dryness to windward. The keel is a NACA foil of 1,75m draft for power to windward. This is combined with a semi-balanced rudder on a partial skeg, to give good directional stability and helm response. A benefit of metal construction is that features like keel draft and rudder configuration can be readily adapted to suit the requirements of anyone who wishes to commission such a variation to the design. Structural design is to the ABS Guide for Building and Classing Offshore Racing Yachts. Construction is of steel using a stringer system and one-off hulls are built over temporary frames. Bulkheads are structural and are bolted to tabs on the stringers. Production hulls can be built over a spaceframe to achieve rapid and economical construction. Excess weight is trimmed out by eliminating unneccesary structure. Most metal boats have transverse framing in addition to bulkheads, resulting in excessive structural weight and wasted structure. With the use of structural bulkheads and semi-bulkheads, the transverse framing has been eliminated. The available interior layouts are comfortable and spacious, with good privacy for two couples and additional berths in the saloon. They are designed around a central engine position, which moves the engine from the conventional under-cockpit position to one of all-round access for maintenance and where it is better placed for weight distribution. Also available is a pilothouse version of the design, which has three double cabins and includes alternatives for bow and stern cabins to give builders a range of interior options on the basic design. The cockpit is T-shaped for wheel steering, with sleeping length side seats. Aft of the cockpit is a boarding platform to ease boarding from a dinghy or the water. The rig is double headsail sloop rather than cutter, which would have the mast placed further aft. The double spreader mast is deck stepped with double lower shrouds and running backstays. Standing intermediate backstays or a jumper strut can replace the runners, if preferred. The full-batten main has mid-boom sheeting, led forward along the boom then aft to the cockpit. This keeps the cockpit bridgedeck clear of traveler and controls. The DIX 38 is an attractive boat capable of taking her crew to exotic corners of the world in comfort. Her styling is not extreme so she will not date and will hold her investment value if looked after. Testimonial from Rob Coulon - Caernarfon, Wales. He writes of a newly launched steel DIX 38. "Just a few words on performance. She sails like a glass boat and is very responsive to the wheel, for example going to weather at about 7 knots in 15 knots. She is perfectly balanced in all aspects of sail. She tacks like a Lazer dinghy. The boat is incredible." Also available is a pilothouse version of this design, the Dix 38 Pilot. 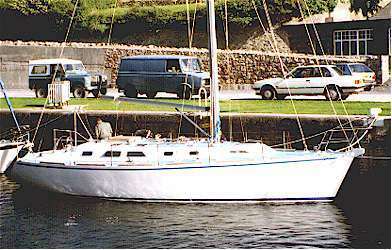 For a larger boat of similar concept see the Dix 43.